For the marinade, mix the first 5 ingredients, add fresh rosemary. Pour marinade over steaks and allow to stand for at least an hour, preferably overnight. Cook cherry tomatoes in a grill pan, drizzle over a little olive oil and season to taste. Set aside. 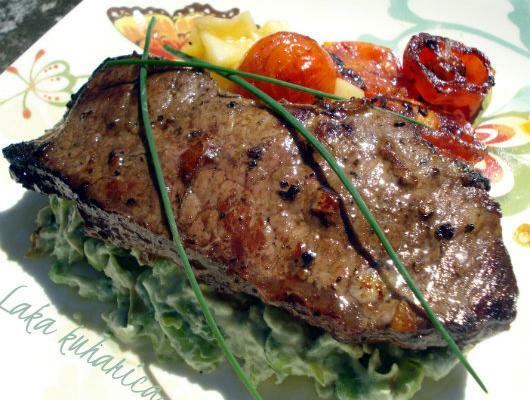 Remove the steaks from the marinade and cook for 2 minutes on each side in hot olive oil. Reduce the heat, add butter and cook for another 2-4 minutes, turning once, depending on how rare you like your meat. Transfer to a plate, set aside in a warm place to rest. To make the mash, cook green string beans and peas in boiling water for 8-10 minutes until tender, then drain and cool under cold water. Tip them into a food processor with the ricotta and a tablespoon of olive oil. Season with salt and pepper, blend them to a rough purée. Transfer the mash to a pan where the stakes were cooked and gently heat it for 1 minute. To serve, divide the purée among warmed plates and arrange the steaks on top. Finish with a pile of roasted tomatoes, a drizzle of olive oil and some steamed new potatoes.